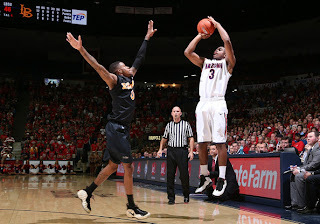 With their thrilling victories over Florida, San Diego State, and Colorado in the last few weeks, you could argue that the Arizona Wildcats, who currently sport a 13-0 record and are ranked 3rd nationally, have participated in the three most exiting games of the young college basketball season. 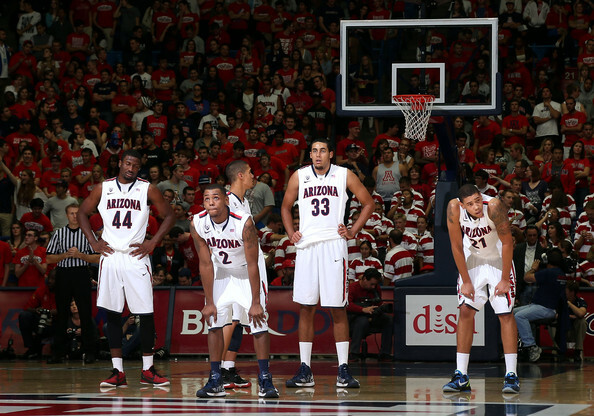 And while most of us can concede that they’re a talented team who has ridden some combination of luck, skill, and an uncanny ability to mount late game comebacks against good teams, to an undefeated start as conference play kicks off, what can we make of the Wildcats given what we’ve seen from them thus far? The truth about this team almost definitely lies somewhere between those two cliché’s, but lets take a deeper look at each of the Wildcats three wins against Florida, San Diego State, and Colorado. 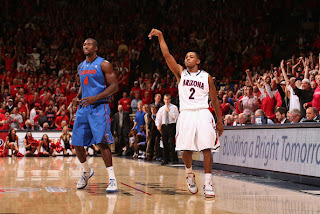 The Gators jumped out to an early first half lead that swelled to 11 points with less than two minutes to play, but Arizona ended the half on an 8-0 run that gave them plenty of momentum and riled up their home crowd. Of course, Florida used a barrage of three pointers to once again stretch the lead to 11 halfway through the 2nd half. Fast forward to around the one-minute mark; Arizona is trailing by six and Florida has the ball after a Mark Lyon’s missed three pointer. Then, all hell breaks loose. 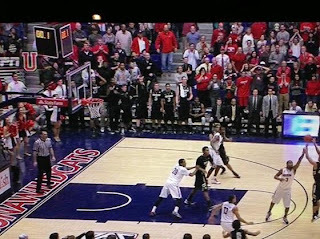 In a scenario that only a 12-year-old Arizona fan could conjure up, the Gators turn the ball over three straight times, proceed to put the Wildcats on the line on two of their next three possessions so they can score without precious time ticking off the clock, and senior guard Kenny Boynton who is shooting 85.7 percent from the line, misses the front end of a one-and-one, which gives Arizona the ball down one with 21 seconds to play. One cold blooded Mark Lyons jumper later and the Wildcats somehow escape with a W.
Maybe because they were playing like a bunch of college kids who were pissed about this game being held on Christmas, this one started off ugly. At the under 16 timeout Arizona led by a score of 3-1, and everyone watching had flashbacks of that time they went to a girls junior varsity basketball game in high school because they had 15 minutes to kill. Things picked up from there, and the two teams managed to combine for 56 points at the half to make for a somewhat decent halftime total. SDSU actually started hitting some shots in the 2nd half, and took an 8 point lead with 13 minutes to play. It tightened up from there, and the ridiculous ties/lead changes I mentioned earlier took place. Down the stretch, Kevin Parrom hit a huge 3 with just under two minutes to play, the teams traded free throws for four straight possessions with Mark Lyons hitting the eventual game winner at the line. SDSU had a great chance to win the game at the buzzer, but all 6’3’’ of Nick Johnson registered an emphatic game-saving block on what would have been an otherwise easy layup for Chase Tapley. 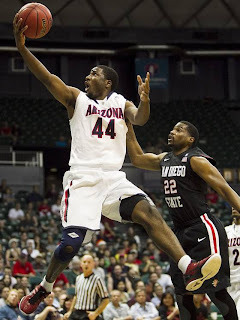 Also, Jamaal Franklin’s insistence upon wearing long sleeves continued to frustrate everyone who watched. Although the consensus right after the shot was waived off (and the morning after, for that matter) was that the refs blew this call and Chen had indeed gotten the shot off, it’s about as close as these kinds of calls get. Oh yeah, and if you’re keeping count, it was two more Mark Lyons free throws in the final seconds of regulation that sent the game into overtime. As you would expect, Arizona outscored Colorado 12-3 in OT and walked away with yet another win that left many of us wondering what the hell we had just witnessed. But even considering all the different pieces on this team, and their impressive early season play, there’s absolutely no way the Wildcats are the 3rd best team in the country, nor should we simply brush off the fact that they’ve needed a serious confluence of fortunate events to be where they are at the moment. Of course, their record and the fact that opposing teams have wilted down the stretch clearly has something to do with the way Arizona is playing. This is a deep, veteran team that can certainly compete with anyone in the country when they’re at the top of their game, and they’re about as streaky as college basketball teams come. What we’ve already seen on a few occasions is that this team can sleepwalk through stretches of play, and find themselves in big holes that most teams wouldn’t be able to dig themselves out of. It hasn’t come back to bite them yet, but sooner or later you have to think that this team won’t be able to pull a rabbit out of their hat when they’re facing a big deficit and little time to overcome it. Is Arizona lucky to be 13-0 right now? Of course. Are they also a good team that has excelled late in games? Yes. Considering how close their games against Florida, San Diego State, and Colorado have been, Arizona could just as easily be 10-3 right now and ranked somewhere in the mid to high teens. Because of what would appear to be a tendency to let their guard down and not play up to their potential all the time, they look like a candidate for an upset at a relatively early stage in the tournament. Although I will say that there's something about the veteran leadership of Lyons, Hill, and Parrom, (Lyons specifically) that will make me uneasy when I'm filling out my bracket in a few months. Thankfully, we still have two-plus months to try to figure this team out, and I think we’re gonna need it.